← The Healthiest Breakfast Ever, Maybe? Here’s a filling meal that cooks quickly enough you can do it on a weeknight. The only problem is that, at least when I did it, I got enough grease everywhere that a cleaner person might have then been cleaning the kitchen floor until bedtime… But maybe you’re a tidier cook than I? Place an oven rack in the bottom position and preheat oven to 450 degrees. 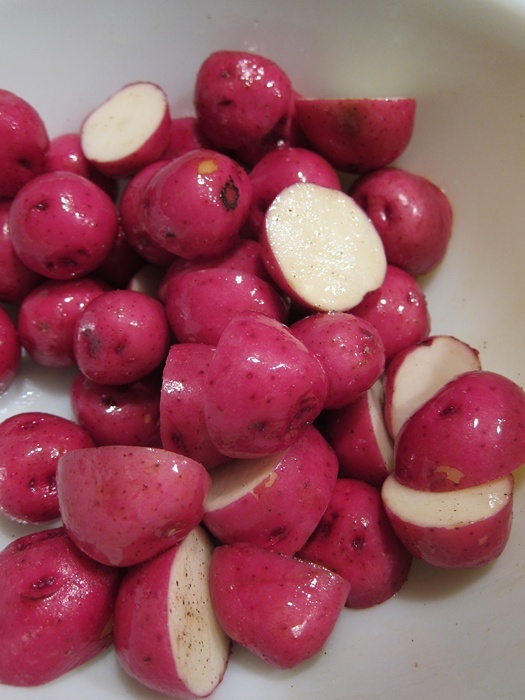 In a large bowl, drizzle 1 tablespoon of olive oil, salt, and pepper over the potatoes and toss to coat the potatoes. Cover with plastic wrap and microwave 4-7 minutes, until the potatoes begin to soften. When you can pretty easily stab them, you’re at a good point. Pre-cooking like this means they won’t take so long later, and can mostly just be cooked with the chicken. Pat the chicken dry with paper towels and sprinkle lightly with salt and pepper. Place a large oven-safe skillet over medium-high heat and add 1 tablespoon of olive oil. When the oil is hot, add the chicken, skin down, and cook until the skin is crispy brown. It’s fine if the whole chunk of chicken isn’t cooked through, that’ll happen in the oven. Remove the chicken from the pan and add the potatoes. Cook, stirring occasionally, until they start to brown. 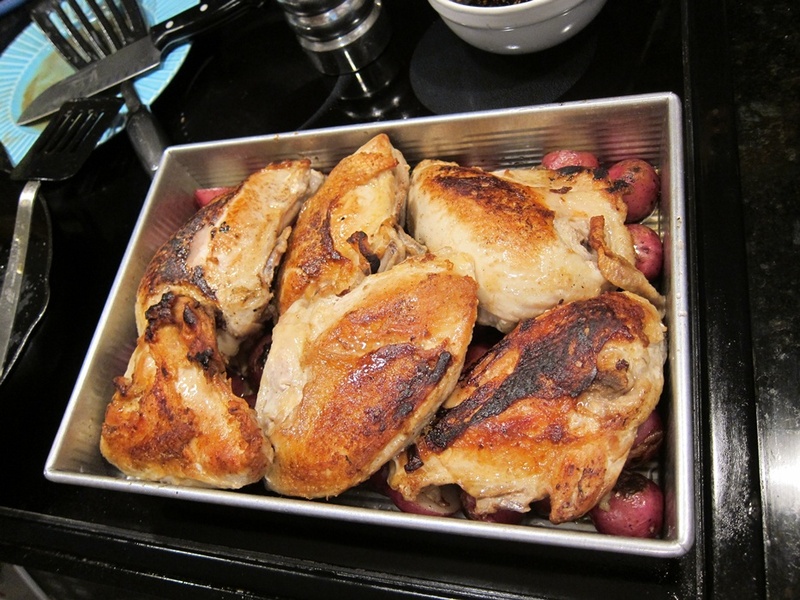 Once the potatoes have started browning, place the chicken skin-side up on the potatoes, and put the whole thing in the oven. 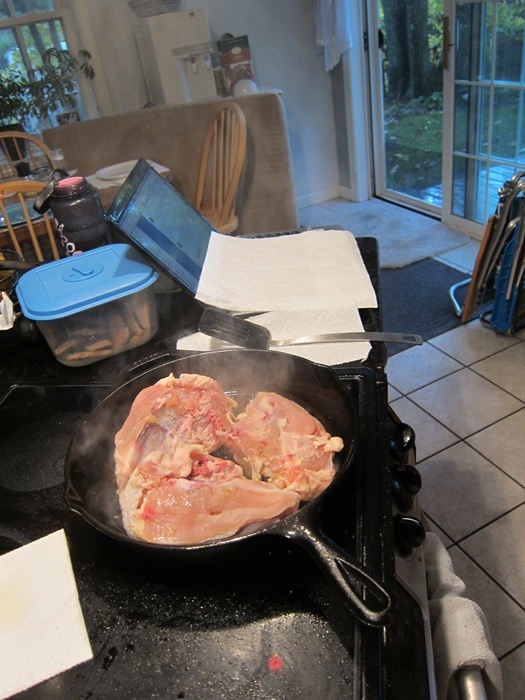 I had doubled the amount of chicken, so it didn’t all fit in the skillet at once, so I just put it all in a bigger pan. Cook 13-15 minutes, until the chicken is cooked through. While the chicken and potatoes cook in the oven, whisk together the remaining 2 tablespoons of olive oil with the vinegar, garlic, thyme, and red pepper flakes. Season with salt and pepper to taste. I ended up adding a bit more vinegar, to make it a bit tangier. 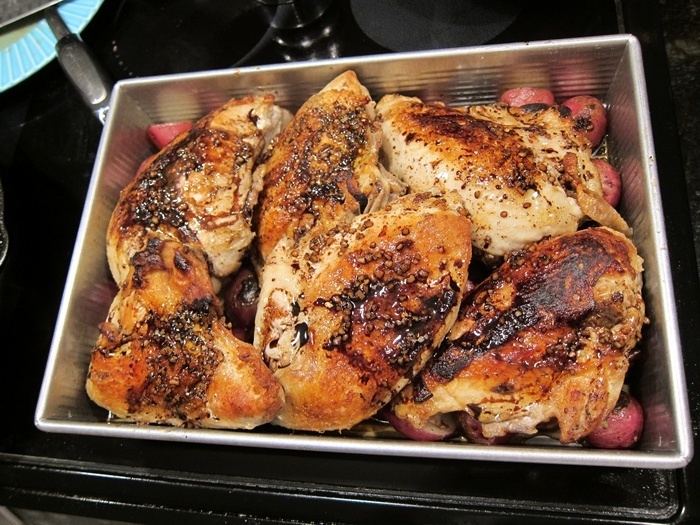 When the chicken and potatoes are ready, drizzle with the vinegar mixture. 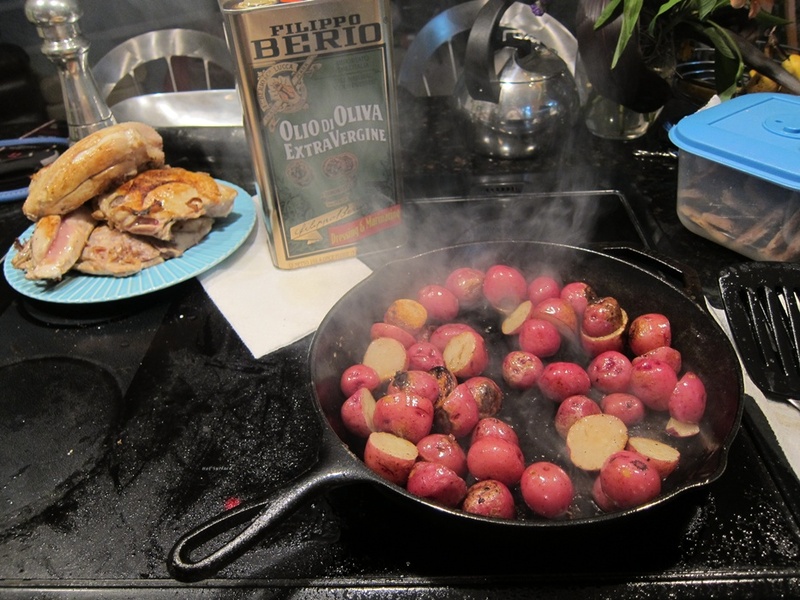 In a large bowl, drizzle 1 tablespoon of olive oil, salt, and pepper over the potatoes and toss to coat the potatoes. Cover with plastic wrap and microwave 4-7 minutes, until the potatoes begin to soften. Pat the chicken dry with paper towels and sprinkle lightly with salt and pepper. Place a large oven-safe skillet over medium-high heat and add 1 tablespoon of olive oil. When the oil is hot, add the chicken, skin down, and cook until the skin is crispy brown. Remove the chicken from the pan and add the potatoes. Cook, stirring occasionally, until they start to brown. Place the chicken skin-side up on top of the potatoes, and put the whole thing in the oven for 13-15 minutes, until the chicken is cooked through. While the chicken and potatoes cook in the oven, whisk together the remaining 2 tablespoons of olive oil with the vinegar, garlic, thyme, and red pepper flakes. Season with salt and pepper to taste. 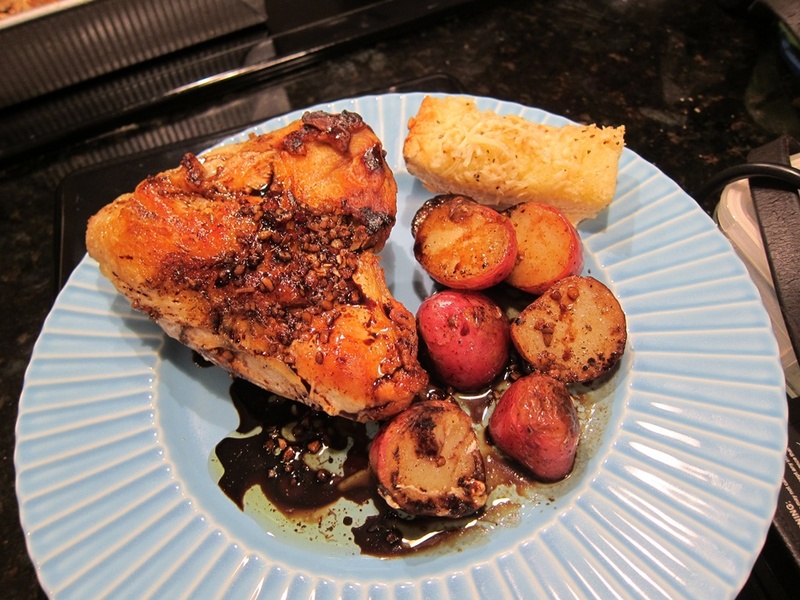 Drizzle over the cooked chicken and potatoes. This entry was posted in Dinner and tagged Chicken, potatoes. Bookmark the permalink. Sounds like you could cheat this and do it all in the oven, maybe, to make it tidier — potatoes would take longer (45 minutes, I’d guess), but you could still get the skin crispy. My mom’s oven chicken did — preheat the skillet really well in the oven, throw some butter in and let it melt and get hot, and then add the chicken, skin down for about 5-7 minutes. Then flip and finish like the rest of the recipe. This sounds REALLY good (except for the clean up part — which my general laziness might have solved?). Good thoughts! I…cooked it shortly before the cleaning lady came, and just said “eeeeh she’ll deal with that, right?” thus also lazily solving that problem.